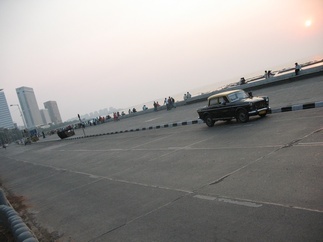 About a month ago we went to Mumbai over the Diwali weekend. 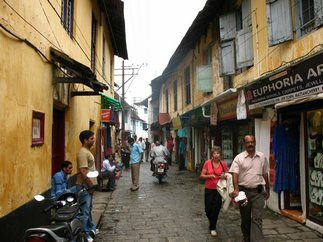 Formerly known as Bombay, it is the commercial and entertainment capital of India. 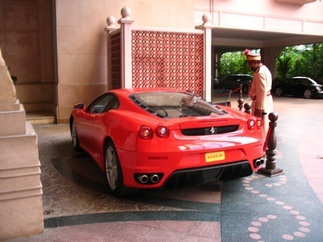 A few hours before our flight in Bangalore, we went to the Leela palace and saw this brand new Ferrari F430. 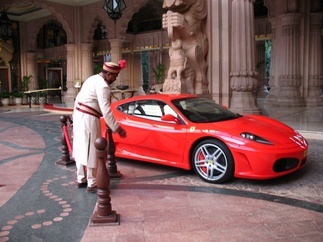 The son of the owner of the Leela Palace was driving it. It was a little bizarre to see such a new Ferrari amongst the auto-rickshaws and bustling streets of Bangalore! 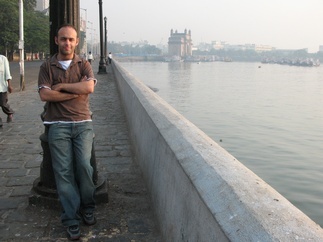 Our hotel in Mumbai was just by the Gateway of India. 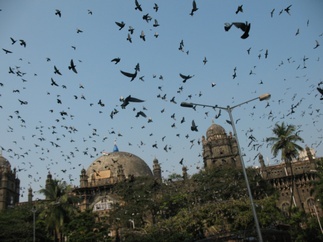 We visited the Taj Mahal Hotel, Bombay Stock Exchange, Marine drive and a few other sights of the city on the first day. 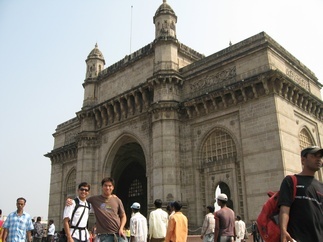 Fu-Wing and me at the Gateway of India. 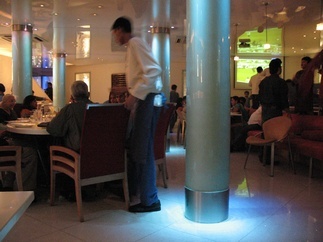 We had dinner at “Tendulkar’s Restaurant”, a restaurant bowled up by India’s famous cricketer Sachin Tendulkar. As expected, the decor was heavily based around cricket and Mr Tendulkar. Even the menu had labels such as ‘Sachin’s favorite’. I had a delicious crab masala and Bombay duck, although it was not really a duck. Next day we met up with my cousin Jamil and his work mates (all from the UK) who are currently working on an engineering project in Mumbai. 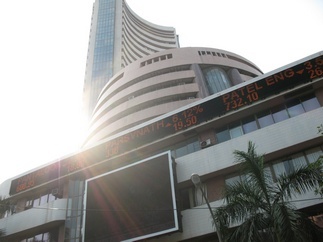 Their client is Reliance Industries, India’s largest private sector company. 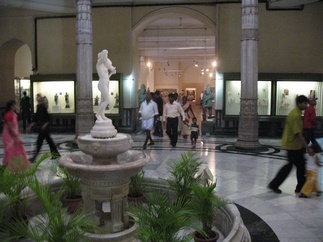 The Mumbai museum was interesting. 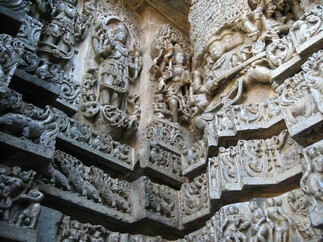 I learnt a alot about India’s past. It was very hot though and water was prohibited. 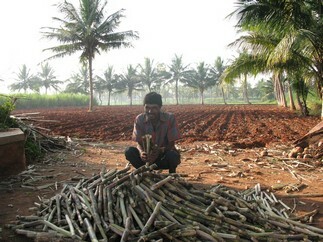 Jamil and his workmates actually live in North Mumbai. 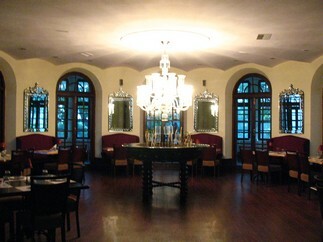 It takes so long to get down to Colaba, South Mumbai, they actually stayed over at the Oberoi hotel. The promotional channel had this memorizing song by FC Kahuna – Hayling. Have a listen at exactly 2 minutes into the song. 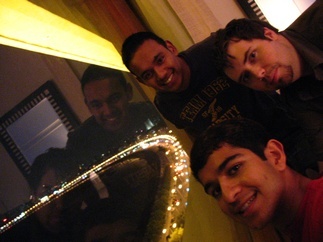 View from the room with Jamil and Gary. 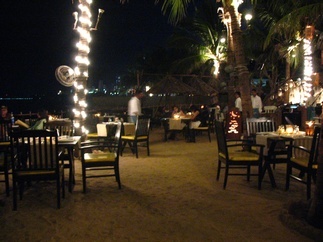 We later went to a beach bar/restaurant and then a jazz club called “Not just jazz by the bay”. The theme of the night was classic rock. The signer and guitarist were pretty good. 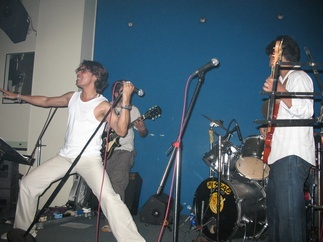 I left early and missed out on a cover of ‘Black is Back’ by ACDC, nevermind! Next morning Marco dragged me out of bed (I promised to wake up!) to join in with the laughter yoga clubs around Mumbai that start around 7am, but we failed miserably. Instead we took photos with the golden morning sunlight. One more thing, being the Diwali weekend there were a lot of fireworks being set off that lit up the city at night. Some were set off right in the middle of roads! 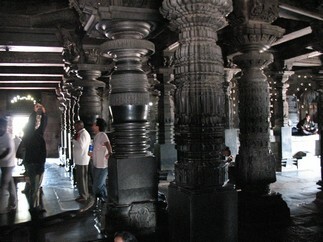 All in all Mumbai was a nice big city break. 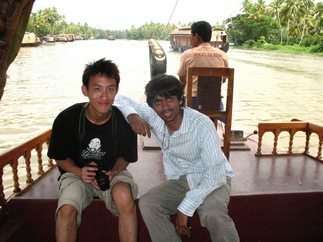 Two weekends ago we went house boating in the Backwaters of Kerala. The views of the canal, exotic palm tress, watching people go about their daily life, the fresh air and eating big prawns was a good experience. The houseboat itself had a lot of entertainment (except cable TV obviously). The two rooms had AC too for a comfortable sleep. 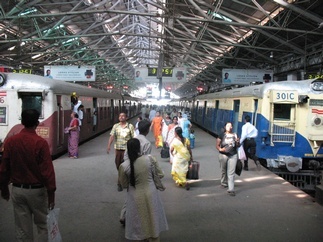 On the way back we stopped off at Cochin. We went to the Jew Town area where there was a Synagogue and European looking cobble stoned roads. In the past the area has been occupied by the Portuguese, Dutch and British. We had lunch at a French restaurant. I ate a something ‘de Normandy’ … all I remember was that the sauce had a thick mushroom flavour, very French and delicious! Arrr, matey! What’s that over there? 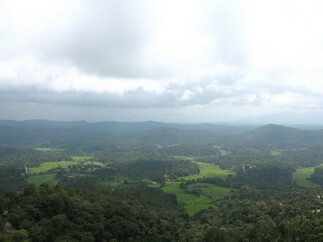 Last weekend we went to Coorg, about 2 hours drive from campus. 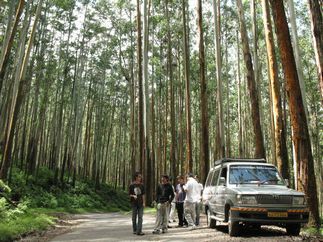 We drove through bumpy roads most of the way there. 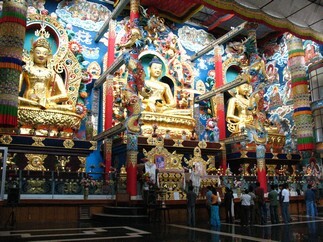 Our first stop was at a Tibetan monastery to see the golden temples. 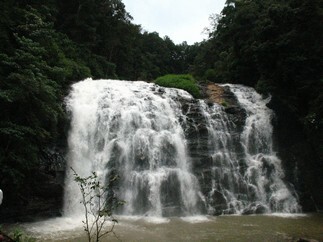 We then went to see Abbey falls. It was moderately pretty. There were some nice views from the high altitude of the location. Our last stop was at a bamboo forest. It was quite empty but there was a suspended bridge that swayed (if everyone together bounced on it hard enough), some tree houses, rabbits, dears and elephants. 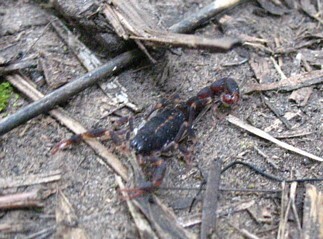 Antony managed to spot a small scorpion too! 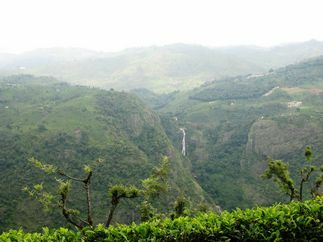 Two weekends ago we set off Saturday 5am and headed for Ooty. It was a bumpy ride there since there roads were scattered with pot holes, so we were grateful for the suspension the 4 x 4 taxi had. 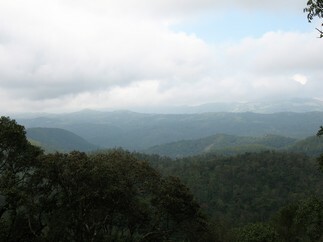 Our first stop was at the Bandipur National Park. The 300 Rs bus ride was disappointing. We only saw some peacocks, dears and a few elephants running away. 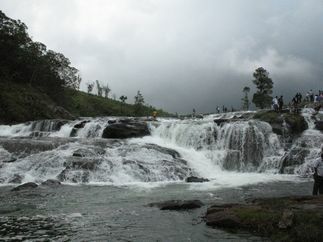 Next stop was Ooty, but we detoured and went via Payakara where there was a lake and waterfalls which were both quite pretty. 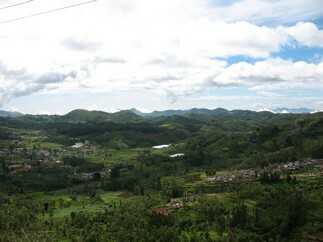 The uphill roads to Ooty offered very scenic views. At certain times we were above the clouds. Our car was so close to the edge it was a bit scary for those sitting on the side. 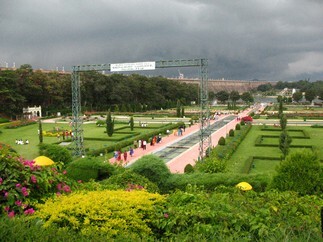 We went to the ‘Botanical Gardens’ too, it was good but nothing really impressive. 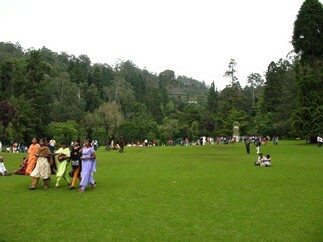 Ooty is 7,440 feet above sea level, so it was pretty cold in the evening and morning. I completely forgot to bring more than one layer. But it was fine. It got down to about 10 Degree C at the lowest. Our stay overnight was lush: three rooms with a dining room and living room. Each room had a TV and separate bathroom. All for £4.85 each. 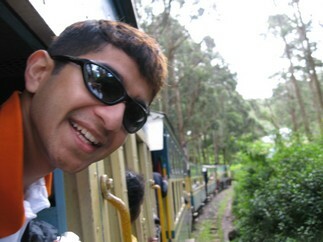 Sunday morning we took a scenic train ride to Coonoor. 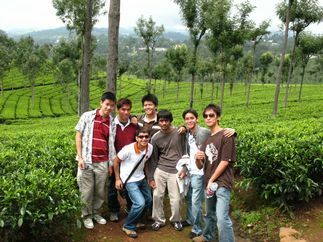 After that, we went to a tea factory to see how tea is processed right from picking the leaves to packing the granules. There was a variety of tea on sale too including ‘Masala Tea’, believe it or not! That had a strong scent of ginger to it. 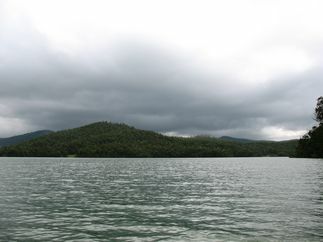 We later went to several viewpoints including one called ‘Dolphin’s Nose’. I can’t figure out why it is called that. 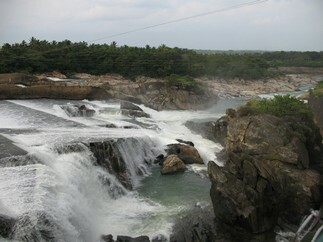 It had a waterfall running through the middle of it though. 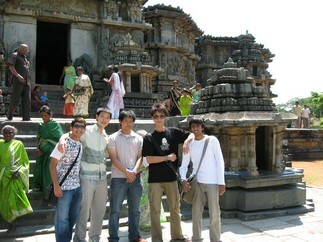 Finally we headed back to Mysore. 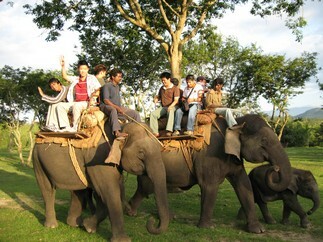 We stopped at the Bandipur National Park again to see if we could ride some elephants. We were in luck, they were available. 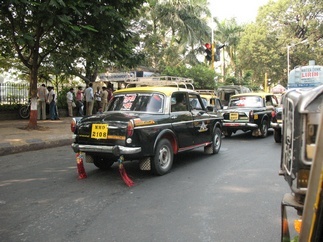 It was interesting to note the driver push his legs onto the elephant’s ears to direct it. He also used a cane a few times, though I hope it didn’t hurt the animal. Elephants have very tough skin so hopefully not. 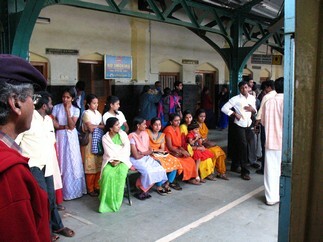 Last Saturday morning we planned to take the train to Bangalore. 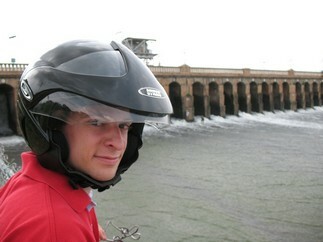 As we set off at 7.30am in the morning, Jason asked, “Shall we just go with the bike?”, so I replied, “Sure, let’s go!”. And so we did, it took us 3.5 hours! 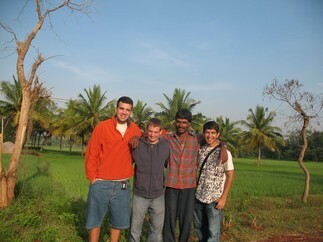 Once arriving there we met up with his friends Samdu and Hemant (Jason has spent two summers in Bangalore previously). 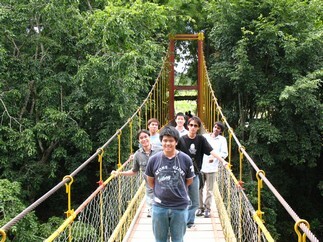 They were really funny and fun to hang out with. 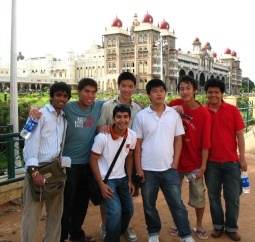 Together we went to some malls, coffee shops, the Leela Palace Hotel, a Chinese restaurant with ridiculously great starters (! 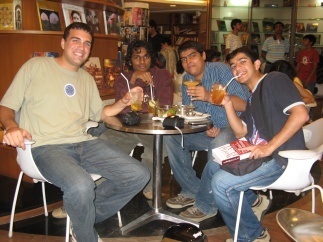 ), more excellent Indian restaurants and also a few places during the evening to chill out while watching some live 20-20 cricket world cup matches which are popular over here. 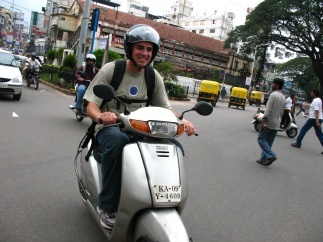 Since Samdu and Hemant both had scooters, I got to ride around Bangalore. It was pretty fun. 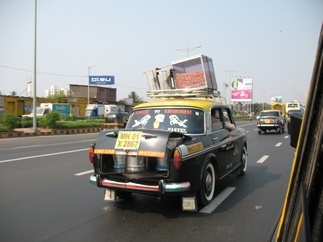 Weaving in and out of traffic is comparable to driving in Bangladesh, except the roads are bigger in Bangalore. The driving is very organic. The traffic lights have countdown clocks on them too which is handy. We got back on Sunday evening. It rained a bit but other than that it was fine riding back. Hats off to Jason for all the stamina driving there and back. 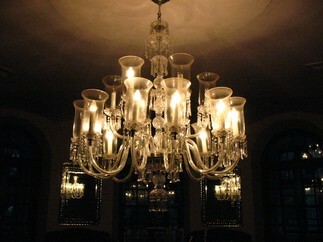 Top photo: At a coffee shop at the Leela Palace Hotel. The passion fruit ice tea was gorgeous. There was free wireless Internet like in the US. 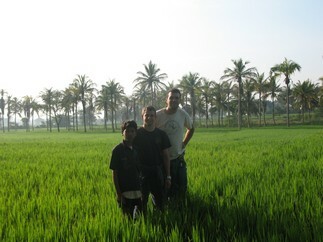 That’s Samdu (L) and Hemant (R). Bottom photo: Jason having fun riding the scooter. 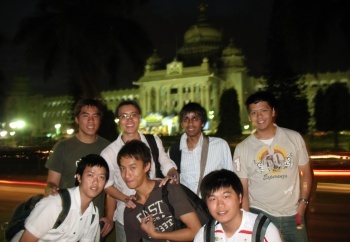 We went to Bangalore this weekend. Some of the Reebok, Adidas, Nike and even Marks and Spencer shops were just like back home except with air conditioning and a guard to open the door. 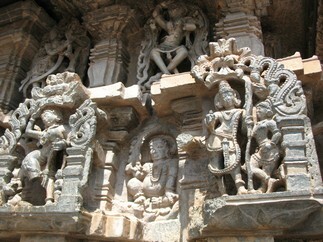 It is like a stepping in and out of the western world. I bought a CK Euphoria cologne from the forum mall and saved £6 compared to back home for a 50ml bottle. Not much of a saving, but the service was much better, the sales assistant literally made me smell about 10 different bottles (with coffee beans in between) before finally choosing. 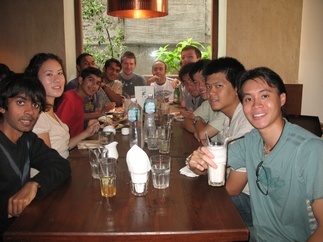 It has been fun hanging out with most of the UK batch and the US batch too. Everyone arrived and left at different times but we managed to see most of each other. A funny part was when Rizwan “felt” others when walking down a street (using his “spider-sense”?) 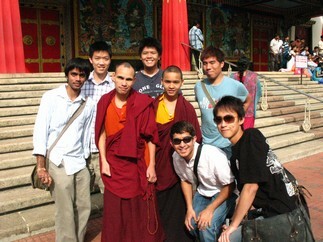 and a moment later we saw some of the UK batch! We also ate some excellent steak! 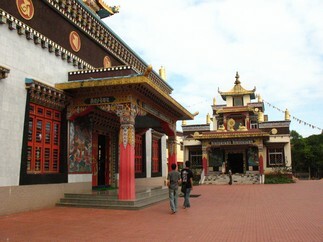 The restaurant was called “The Only Place” since cows are sacred here. I also had McDonalds and the chicken “Maharaja” burger was quite good. KFC was an exact replica expect the till ladies who wore very presentable make-up. 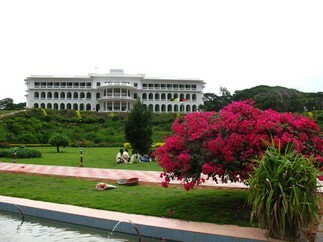 Bangalore is a bustling city great for shopping and eating. There wasn’t time much sightseeing, will have to go back for that next time. 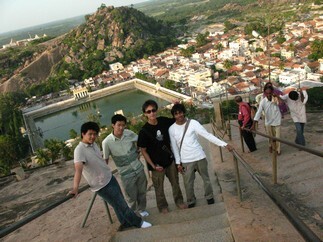 Hats off to Rizwan for organising the trip for the group I was in! 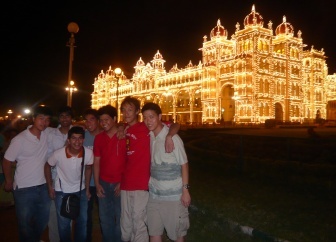 Photo: Some of us with the colossal Vidhana Soudha in the background.